Nov. 14. By Dave Vieser. A few days before the Cornelius Town Board is scheduled to vote on rezoning 11 acres between Catawba Avenue and Knox Road for a major retail center, a different developer is proposing another new project just to the east. The new project, referred to as the “20151 West Catawba Avenue Proposal,” is between the Lake Norman Realty headquarters building and Carolina Telco. Charlotte- based Providence Group Capital is the developer. The old bank building on the front of the 4.35-acre parcel would become a restaurant. Cornelius Planning Director Wayne Herron said the Providence Group proposal calls for a 10,000 square foot office building behind it. Herron said there are some concerns with the application right now—including a request for the wrong zoning. The applicant is asking for Highway Commercial Zoning, but the proposal would require conditional zoning instead. “We actually have a list of items they need to change on the application,” Herron added. The site plan provided by Providence would place the restaurant in an expanded 4,000 square foot one-story building which fronts on Catawba and at one time was a branch of the Mooresville Savings Bank. 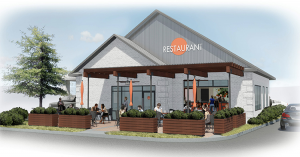 The 10,000 square foot office building would be behind the eatery, and the remainder of the vacant plot which stretches northward towards Knox Road would remain undeveloped. There would be a total of 115 parking spaces provided for both the restaurant and the office building. 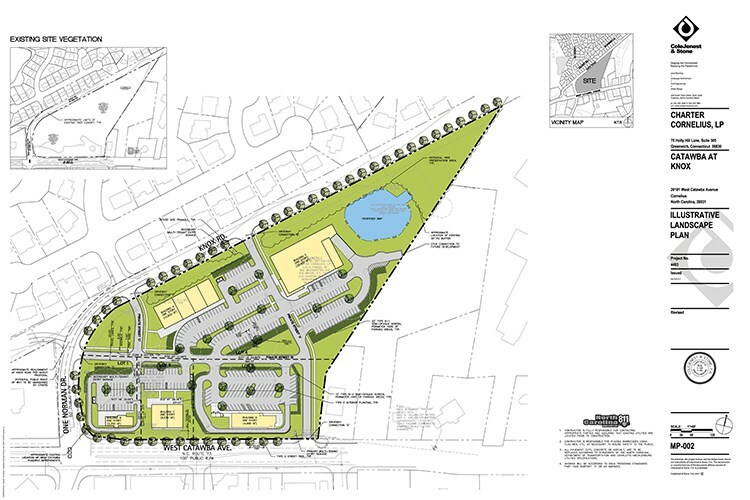 This would be the third or fourth major project planned for West Catawba in short order. Widening of the second part of West Catawba—from Jetton west to Hwy. 73—gets under way in 2020. Two are scheduled for town board review and possible approval on Monday November 19. The projects include retail and office buildings just to the west of the Providence Group proposal called Catawba at Knox. Charter Cornelius LP plans to build five commercial buildings totaling over 40,000 square feet of commercial space on 11 acres at the northeast corner of West Catawba and One Norman Blvd. Charter is a New England based corporation which has successfully built a number of retail shopping centers through the East. The proposed commercial uses include restaurants with drive-through, a grocery store, and potentially a bank. The Nov. 19 hearing may be the last chance for residents to voice their support or opposition to the Charter Cornelius project as well as a project called CD/Nantz. This one calls for the development of approximately 9 acres on the east side of Catawba Avenue near the Nantz Road intersection. The site is currently vacant except for two older homes being used for commercial purposes. 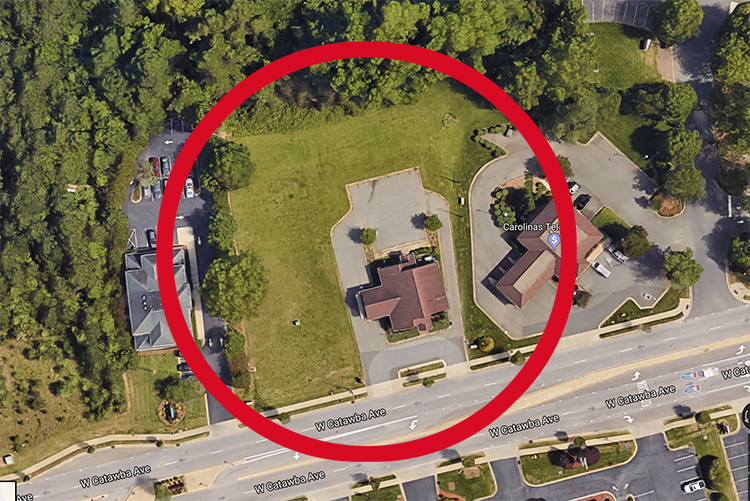 The 7-Eleven will be located just south of the Nantz Road intersection, and Nantz Road will be extended to the south and east of its current terminus to facilitate access to the office buildings, as well as the convenience store. The major change in this project since it was first proposed has been the removal of a Pet Suites from the proposal. At an earlier hearing some residents had voiced concern over noise that might emanate from this facility. If this development comes to pass, the convenience store further east on Catawba will be permanently closed. This store has always been technically listed as a 7-11, but has never been fully branded as such due, in part, to a lack of space at that site. As with the Knox Road Project, coordination with the State DOT will be a requirement. especially in view of the widening project expected to begin in 2020. In addition, the town will hold the issuance of a Certificate of Occupancy (CO) for the retail building in the rear to properly phase with the widening work.